Want to learn the Python language without slogging your way through how-to manuals? 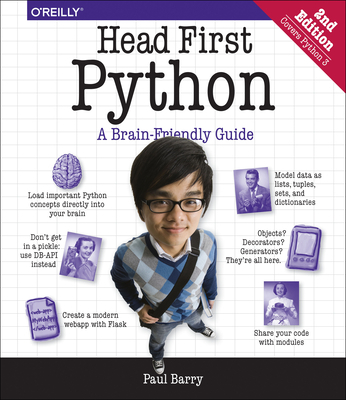 With Head First Python, you'll quickly grasp Python's fundamentals, working with the built-in data structures and functions. Then you'll move on to building your very own webapp, exploring database management, exception handling, and data wrangling. If you're intrigued by what you can do with context managers, decorators, comprehensions, and generators, it's all here. This second edition is a complete learning experience that will help you become a bonafide Python programmer in no time. Why does this book look so different? Based on the latest research in cognitive science and learning theory, Head First Pythonuses a visually rich format to engage your mind, rather than a text-heavy approach that puts you to sleep. Why waste your time struggling with new concepts? This multi-sensory learning experience is designed for the way your brain really works.